The beautifully landscaped pool area makes the perfect hangout after a long morning hike. Meeting up with your crew later in the day? Find a spot by the fire in the cozy lobby. Once you've adjusted, hit the fitness center for a workout. Gather your crew in front of the fire for a Heads Up! speed round. The resort is steps away from the Creekside Gondola Lift, it's ready whenever you are. Ski-in/ski-out access means more time on the slopes. Stroll the beautiful grounds with your sweetheart. There are two outdoor hot tubs at the resort - try them both. Pack a picnic and load up the car, Blackcomb Trail is a 10 minute drive from the resort. Work on perfecting your swing, Whistler Golf Club Driving Range is a 7 minute drive from the resort. First Tracks Lodge delivers as promised. You’ll be out the door, up the Creekside Express Gondola and at the top of the first run in 20 minutes flat. If you’ve got some skills, race the kids down Dave Murray Downhill (black) on the way back – winner gets to choose the movie for later. Tucked along the base of Whistler Mountain, it’s steps from all the Creekside Village shopping, dining and après ski festivities. A massive bluestone fireplace serves as the focal point in the inviting lobby/library. Make that your hangout on non-skiing/hiking/biking days, and spend a few hours making headway with that book you’ve been otherwise neglecting. Take a break mid-afternoon and hit the fitness center before unwinding for a few minutes in the steam room. Whether you’re laying low or hitting the trails hard, make the heated outdoor pool and hot tub your last stop before dinner. Comfortable one- to three-bedroom vacation suites (including a one-bedroom, two-bath plus den option) range from 720 to 1,700 square feet, and sleep up to eight sweet-dreaming mountaineers. There’s even an in-unit washer/dryer for the astonishing amounts of laundry that accumulate when you’re all wearing that many layers. Stay bundled in your hats and gloves for a low-key hot cocoa après ski on your private balcony or patio – quick before the sun disappears. Then head inside and thaw out in front of your stone fireplace for a few minutes before getting dinner in the works. There’s a grocery store nearby if you need to make a quick run. (Keep it simple during the summer months and grill out on the pool patio BBQ.) After dinner, regroup back by the fireplace and see which board game gets more votes – Outburst or Scattergories. An easy, five-minute drive puts you in the heart of Whistler Village. Head for the Olympic Plaza where you’ll find live music on weekends, holidays and during festivals. The après ski scene is alive and well all year round. Or just window shop as you make your way to dinner. The Visitor Centre is worth a stop. Pick up some flyers on local must-sees and ask about the kids’ scavenger hunts tailored to each season. Visiting in the summer months? Alpha Lake Park is just over a quarter-mile away – head south on the Valley Trail. You’ll find a dog-friendly beach, tennis, volleyball and basketball courts – even an unmarked trail that leads to the stunning Pine Point Park, just five minutes from the main beach. Feeling more adventuresome? Go bungee jumping, or treat your crew to the 4x4 glacier tour and sunset BBQ. - Check-in for this property is based at a different location, 2036 London Lane, Whistler, BC, V0N 1B2. 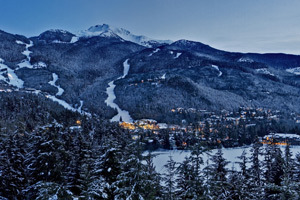 Known as "the Creek" for its laid-back atmosphere, Creekside was the original base of Whistler Mountain. The area includes a grocery store, ski rentals, restaurants and shops and is accessible by car, bike or on foot. Creekside is family friendly and offers plenty of activities for kids and teens.